Wedding rings are one of the most sentimental pieces of jewellery one will ever purchase in their lifetime and sometimes it’s difficult to find that perfect ring for you and your partner to represent your love for each other. For that reason, Juvelisto School of Metal Arts have created a private workshop for couples to create each other’s wedding rings. 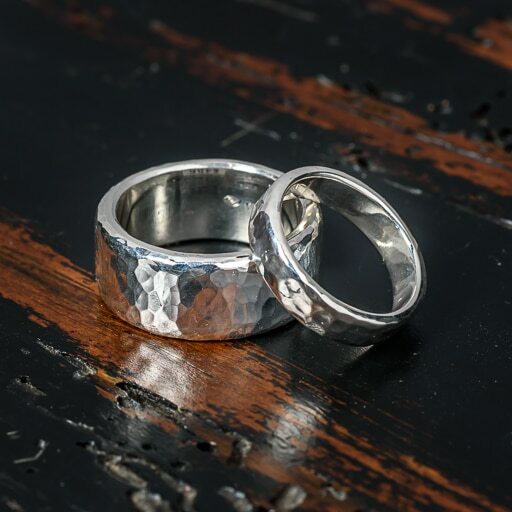 Not only do you get to create your partners wedding ring, you and your partner will get to share a memorable experience together that will make your wedding rings that much more meaningful. We offer two methods of creating the perfect wedding bands and the one you chose will depend on the type of jewellery making technique you and your partner want to learn as well as the design you wish to accomplish. Sit down with your fiancé, find the creation process that suits your individual needs and sign up today to create your very own wedding rings made with love, by you! Hand construction allows you to work directly with the metal of your choice. Each couple will learn the process of heating, shaping, soldering, finishing and polishing. The Finished Product: If you and your partner desire simple wedding bands with either a polished conventional look or textured (hammered, matte, etc. ), this course is for you. Time Together: Couples who chose this creation process will often leave their 4 workshop with finished wedding rings. With our help, you and your partner have the option to customize your wedding bands with gemstone setting or engraving. Please allow a few weeks following your workshop for us to make these customizations for you. Designs: We ask that couples wishing to take this workshop to decide on the elements of your designs at least two weeks prior to taking the course as we want to ensure that we have the materials available in your metal of choice for your perfect wedding rings. 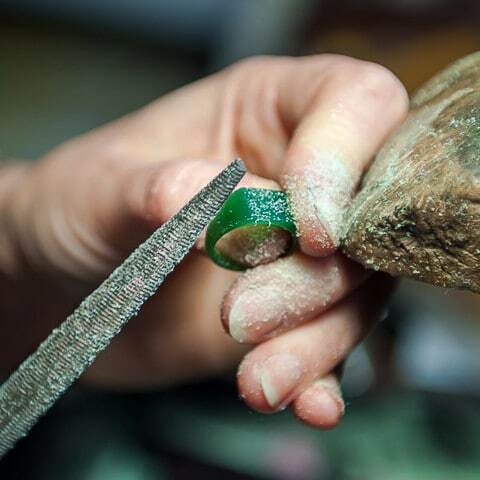 Wax carving is a very forgiving and versatile jewellery making technique where a special carving wax is used to create your wedding rings. This fascinating process involves learning how to cut, file, shape and carve this unique material by utilizing a variety of hand tools to accomplish your desired design. Time Together: The wax carving creation method is a two part process. Your first 4 hour session will be spent designing and carving your wax models and once completed your carvings will be sent off to be cast together in your metal of choice. After your rings have been cast, you and your partner will return for your second 4 hour session where you will learn how to clean your casting by cutting, grinding, filing, sanding, polishing and finishing. There will need to be about 1-3 weeks in between your scheduled workshops to allow for the casting of your rings. With our help, you and your partner have the option to customize your wedding bands with gemstone setting or engraving. Please allow a few weeks following your workshop for us to make these customizations for you. Designs: We ask that couples wishing to take this workshop to decide on the elements of your designs at least two weeks prior to taking the course as we want to ensure that we have the proper wax available for your perfect wedding rings.